In the Kutch region of Gujarat, India, being born a girl is the biggest barrier to getting an education. 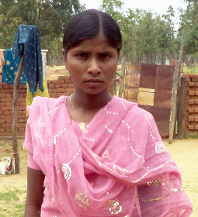 And it was no different for Sheetal who was pressurised by the community to drop out of school because the nearest school was a kilometre away. Not too far for the boys, but out of bounds for girls. CRY UK along with Gram Swaraj Sangh (GSS), creates awareness within the community through street theatre and other interactive mediums about children’s rights to education, healthcare and basic infrastructure. Your support helped Sheetal push the boundaries of local prejudices. Having passed Grade 10 today, Sheetal is a confident and independent girl, and aspires to be a nurse. In the Tuskiyo village of Jharkhand, India - it is a tradition for girls to get married early. And it was no different for Tarnum Khatun. Her parents had started looking out for a groom. Our grassroots partner, Jago Foundation, became aware of this situation and along with members of Kishori Samuha (Adolescent Girls group) reached out to help Tarnum. With extensive dialogue and counselling by Jago and the village child collective group, Tarnum’s parents changed their attitude towards this cultural tradition and put off their decision to get her married. Today, Tarnum is 15 years old and continuing her schooling with the support of her parents, community and you. She represents the change that her community is undergoing. CRY UK ‘Stay in School’ campaign is about ensuring 500 girl children from 80 villages across India do not drop out of school and receive access to quality education for a year. All we need is £5000 to achieve it. In rural India, families live with modest means, and girl’s education is never a priority. Marriage is. And since marriage brings the burden of domestic work and rearing a family, several girls are forced to drop out of school. Facing abject poverty parents often resort to sending their girls to work. Ending their hopes of finishing school. This makes them bound to labour, with no hope of ever being independent. Some families that can afford to send their children to school favour their sons over daughters, causing them to stay at home while their brothers attend school. Lack of separate toilets for boys and girls is one of the leading causes for girls to drop out. The discomfort of sharing a toilet with their fellow classmates and teachers often compels them to give up on school altogether. For many girls, their reason for dropping out is simple. The village school is just too far. Parents, worried for their safety, prefer to have them stay at home than risk travelling thedistance alone. When a girl is able to go to school, she sets off a cycle of positive change. An educated girl stays away from early marriage, avoids exploitation at work and becomes strong and independent. As she grows, she is able to make better choices for herself. This transforms her present life, gives her a secure future and helps her to look out for her family too. Educated girls grow up to be empowered women and can influence the communities they live in, for good. Name is mandatory. Email address is mandatory.